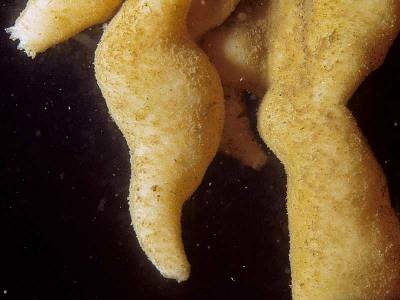 Description: This is a bag-like sponge with fairly thin walls, looking like a large Grantia compressa. It is yellow-white in colour and each hollow body has a terminal osculum. Occurs in clusters. Habitat: Diving records are mostly from specimens found on wrecks in shallow water. Distribution: Reported recently only from Orkney. Older records from Shetland and the Faeroes. Similar Species: Grantia compressa is similar in overall appearance but smaller and typical of the shore and very shallow water. Picton, B.E. & Morrow, C.C. (2016). Sycandra utriculus (Schmidt, 1869). [In] Encyclopedia of Marine Life of Britain and Ireland.